This is a quiz on former golfing great Greg Norman who is most remembered for his meltdown in the Masters'. 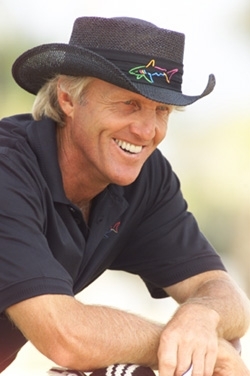 Great Greg Norman trivia and facts! 1. What was Greg's nickname on the PGA Tour? 2. Greg began playing golf at what age? 3. In what country was Greg born? 4. What event did Greg win for his first career PGA win? 5. How many Masters' Championships has Greg won during his career? 6. Greg only won 2 Majors during his career, with both wins being in the same Major. What was the only Major that Greg managed to win? 7. "The Masters Disaster" is known as one of the biggest chokes in golfing history, where on the final round of tournament play, Greg had a 6-stroke lead and ended up losing by 5 strokes to what golfer? 8. Greg was once married to what former tennis great? 9. What was the name of Greg's 2006 autobiography? 10. What President fell down a flight of stairs in Greg Norman's home in 1997, tearing knee tendons that required surgery? HINT:He was President at the time.